Getting There (transit): Take the HSR Bus #52 to Cootes & Dundas Street. Walk Dundas to Thorpe, then Thorpe to Meadow Lane. Getting There (car): You can park on Meadown Lane at East Street (unsigned street), across from the Canadian Tire warehouse. Obscurity Rating: 5/5 - No signage, unmaintained, off obscure street stuck between a steep hill and a creek. Bonus points to this place for being this obscure in the middle of an urban environment! A lot has changed in Dundas in the last hundred years. 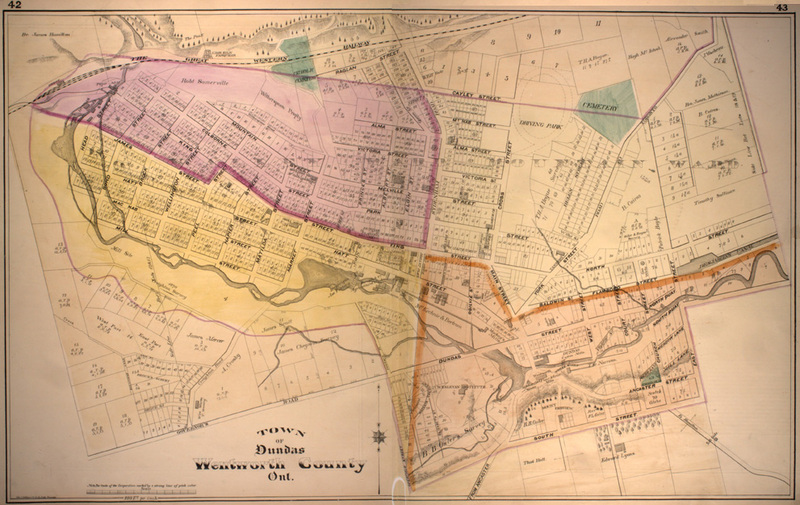 One map I came across about a year ago shows how Dundas looked like (or, rather, was proposed to look like) in the 1890s, and you can find some interesting urban hikes by checking out streets that either once were or were supposed to be. One curious part is the existence of two streets along the Spencer Creek: "North Quay" and "South Quay". These two streets are located on the lower right side of the map, in an area that was once the 18th century village of Coote's Paradise. Today, what remains of "North Quay" is a small section of what is now Dundas Street, and South Quay is actually technically still a street, though it looks far more like a hiking trail. It was actually re-opened as a one-lane through street to Osler Drive briefly around 2004 during a bridge replacement on Thorpe Street. So why I'm I talking about these old streets? If you follow the map you'll see that North Quay continues through what is now the Spencer Creek trails, and South Quay continues on the other side. Now, presently South Quay ends at Thorpe Street and there are houses and buildings present now where the street once continued, but once you get around them (via Meadow Lane) you can enter into a forested area with a trail leading to the creek, that then follows along the historical path that South Quay would have connected with, to an even older road that I later discovered once was the main road towards Hamilton. Following this trail leads eventually to a fork - go forward, or turn right. Having gone forward a few times before (though I've not yet been to the end... that's for another day! ), I decided to check out the trail on the right. It actually does lead somewhere, which is something I didn't expect. Followed south then slightly southwest, it actually connects with Sheldon Manor Park. I now know another way to enter these trails! At some point in the future I'll likely have another post about South Quay, as the street as it exists now is basically a walking trail, and is actually teeming with wildlife. Deer, birds, squirrels, opossums, and more. And, it can be walked as part of a half-urban half-wilderness loop that can take an enthusiastic explorer through four ghost-roads-turned-trails. But those details will come when I take this hike, some time in the near future.